We made a poster display for the party explaining why each person was our Real Life Superhero. Jax’s first birthday party had a theme of “Real Life Superheroes.” While you might immediately think we were talking about Jax, we weren’t. Not really. What we really wanted to do with that theme is honor the people who saved Jax’s life. Mainly, his NICU nurses. We consider his nurses our Real Life Superheroes because of the way they influenced our lives in a way that I’m barely able to explain. The only reason Jax was even able to celebrate his 1st birthday was because of the skill, dedication, and compassion of the nurses who cared for him. 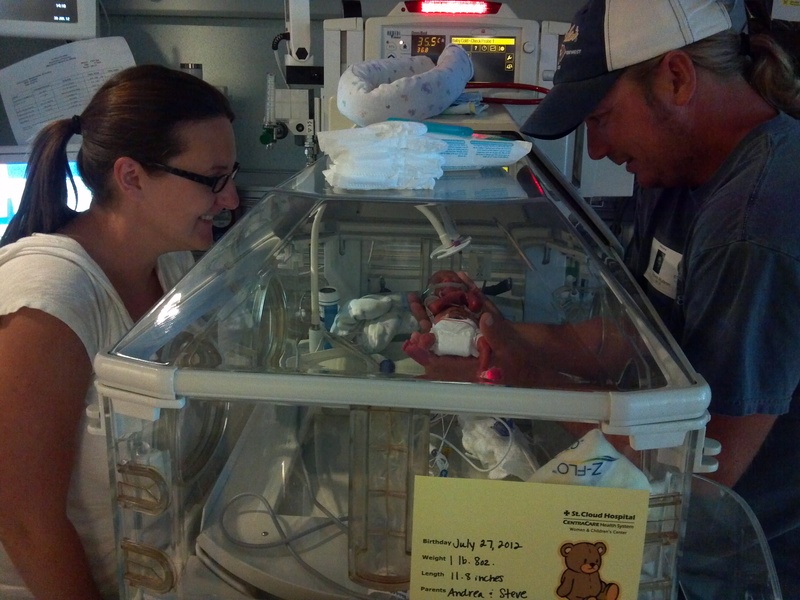 His NICU nurses were by Jax’s side day in and day out. They were the ones who knew his quirks, tricks, and signals. Sometimes they knew him even better than I did. His NICU nurses advocated for Jax and were our liaisons with the doctors. They noticed when something just wasn’t quite right and made sure the doctors knew. They sat next to Jax’s bedside for 12 hours straight when he was sick, doing everything they could to keep him stable and comfortable. Not only did Jax’s neonatal nurses take care of him, but they also took care of me and Steve. They could tell just from a single look that we needed space or that we were struggling to understand and needed more information. They were the ones who made me take breaks from Jax’s bedside to get something to eat. We didn’t get a chance to take our baby classes, but we had something better! We had 93 days of one-on-one training from some of the most highly educated and skilled nurses around. These NICU nurses taught us how to “hold” Jax through the isolette portals when he was too weak to be held, by cupping his head and his feet. They taught us how to touch him with out ripping his skin. They were the people who taught us how to work his oxygen. They taught us how to change his diapers and give him a bath around all the tubes and wires and monitors. They helped us with Kangaroo Care. Deidra did Healing Touch on Jax every night. Angela made sure he had the cutest and comfiest blankets. April made sure we were involved with all of his cares. Kate made sure we had all of the information we needed. Linda made sure I knew what was coming down the pike. Mary Ann drew me pictures to help me better understand complicated procedures. We give thanks to the neonatal nurses that saved Jax’s life every. single. day. Today is National Neonatal Nurses Day. What better time to honor these Real Life Superheroes? I have volunteered at Mpls. Children’s Neonatal Care and I too give kudos to all the nurses as they are definitely Real Life Superheroes. They teach us all about the knowledge and kindness that it takes to make such fragile lives go on. Thanks to each of them. Nurses make all the difference in the world! What did you do as a volunteer? Next Next post: Planning Ahead for Lock-Down and a Big, Important Decision: What Should Jax Be for Halloween?